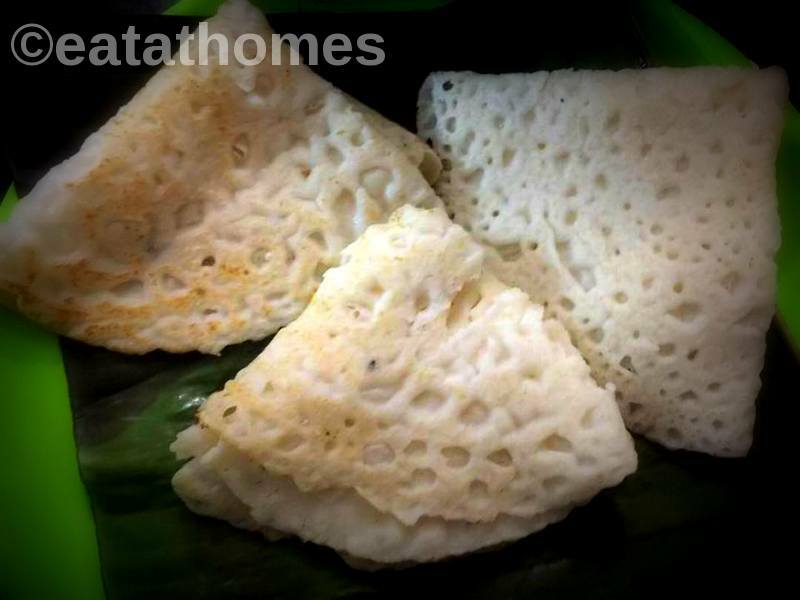 Neer Dosa is Soft, super thin, lacy crepes made with rice batter. this is traditional recipe from mangalore – udupi. Easy to make without any fermenation process. so tasty and melt in your mouth. The key to get that right is making the batter super thin. This dosa is best served with spicy tomato chutney or sambar. If you are a non vegetarian, you can serve it with any chicken curry, mutton curry or duck curry . Wash and soak rice IN clean water overnight. The next morning, drain it and add it to blender along with Fresh Grated coconut. Grind it, once it is half ground, add in some water and grind it into a smooth paste. Once it is done, pour it into a bowl. Now add in more water make it into a thin batter, it should be that thin. Now heat a non stick pan. Drizzle few drops of oil and wipe it with kitchen towels. Now pour a ladleful of batter and swirl the pan to coat it. The batter should coat the pan in a thin layer. Cover the pan and let it cook for 45 sec to a min till the dosa is cooked. Serve with any chutney or sambar..